There is no vastu puja room, generally it is called as puja room only, for the sake of vastu shastra, only we called puja room as "vastu puja room" only. If we built the puja room with vastu shastra guidance and principles then there is a possibility to extend the positive power and residents may get peace of mind while doing puja, meditation, Dyan, prayers. Doing puja in the home or office or factory is highly recommended, personally we are also suggesting people to do regular puja and prayers at properties. Its a sign of decreasing your troubles and sign of good days are near to you. Now a days we are all busy, rush for every thing, we have time to perform all things, but we don’t have time to do puja with leisure, while at the time of doing puja, many things remembering and thoughts going to present day work or yesterdays happenings, lack of concentration and don't have 100% confidence on God's power. Our elders did not do puja what we are doing, they sit for prayers for a period of one hour or two hours, still there are people sitting before God Idols and doing puja's for more than 3 hours, but we never spare such time to God, though we all know about the power of almighty, why we are not sparing such time to puja's what is the reason behind in this, only the thing is now a days the expenditures are very high and our needs are increasing day by day and facing horrible competition. Every body is having their own targets, to reach them quickly every one is rush to go to meet their targets, that is the reason, no one has time to do perform prayers and following the normal customs etc. OK any how do puja with peaceful heart, pray God atleast two minutes, what is your prayer, nothing, yes just nothing, just leave that two minutes to God.. Those two minutes are particularly belongs to God in our life. In these two minutes don’t request any thing or don’t think on any issues belongs to your routine life. Generally the erratic planning of house construction will spoil our pleasant future, so better to have expert vastu consultation before buying or constructing the plot/house. We seen all hurdles in our life, most probably every body's strong aim is their children should not face any serious problems, they must experience the good life. If there is no proper planning how its possible. Don't look to earn easy money, try to do hard work, its automatically blesses with good earnings, securities in the way of funds etc. Here exactly vastu works, at this point vastu has its broaden hands to scrutiny all the things. Puja room is constructed according to Vastu Shastra then God (puja room) will have extra power, that will helps you, as you are the residents of that house, very simple thing to get some more supportive word to this above is "Dharmo Rakshathi Rakshithaha", Dharma is a virtue which its supposed to be we have to protect it, it will protect us. If you are providing more power to God in your home, he will protect you. How simple it it. 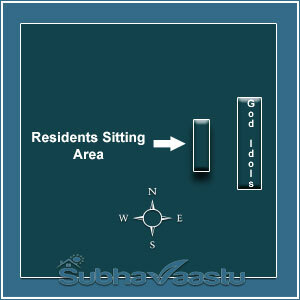 In this image God idols are towards East direction area and residents occupied West direction part and while doing puja residents looking God towards East side, it means residents facing towards East and Gods facing towards West direction. Generally this is providing good results. If your property is having good open space towards East direction then it would add more strengthen to the results. If the property is having Northeast Swimming pool or Eastern Northeast swimming pool then it will double plus to have place God at this point. If there is no windows to that East wall then results may not be satisfactory. Better to arrange very (www.subhavaastu.com) bigger windows to the East walls. Please note that windows towards Northeast room East wall is specifically providing attractive fancy results. We may expect results as per our thought. By seeing narration here, don't plan placing God's at East wall at Southwest room. Before taking any decision in the name of Vastu Shastra its always better to have one expert vastu consultant advise. Its safe for your peaceful journey. In this image God Idols placed towards West wall or direction and God Idols facing towards East direction. Here residents sitting before God and facing towards West direction. It means God is facing towards East direction and residents facing West direction. This is also a good sign of keeping God and residents sitting positions. Let residents first take into consideration that where is this West position, in which room it was. If this West is at Southwest room then its merely waste idea to keep God at Southwest room. 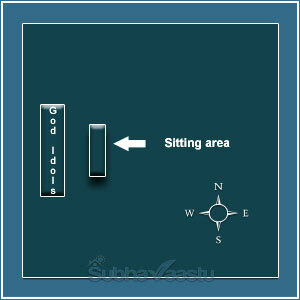 We already given some suggested areas to keep God idols or pooja room at this God Pooja Room link. We many times requesting people, for each and every part of the home is important to yield good results from homes, taking the decision is dead easy, but strict practicing is not so easy to follow. If one residents kept the Northeast room for puja room then he may take the decision that keeping God idols to be at West direction. Anyway our proposal is near to East is added additions to your peace. But keeping the God idols towards West and facing toward East is not an evil idea. You may follow it. 1. Great men need not be great scholars and like wise great scholars need not be great men. 2. Whatever is begun in anger, ends in shame. So always be in peace and every body loves you. 3. After the event, even the fool is wise.Nature, time and patience are the three great physicians. 4. The roots of education are bitter, but the fruit is sweet. Is there any specific place for doing pooja? My friend says that Southeast-east door is good, is it correct? I Need to buy home, who is the best vastu consulant in Bratain? Is swimming pool may be good when planned to built at Southwest corner? My elders provides more space towards West, can I make a good water sump at this place? Which part should be height and which part should be lower when we plan to built compound wall? Is garage considered as a part of the house or not? In USA normally the garages are attached to the house. Please suggest.